Fabian Cancellara sprinted his way to a third career victory in the Tour of Flanders on Sunday as he outgunned breakaway companions Sep Vanmarcke (Belkin), Stijn Vandenbergh (Omega Pharma-Quick-Step) and Greg Van Avermaet (BMC) at the finish in Oudernaarde. Belgians Van Avermaet and Vanmarcke rounded off the podium in second and third respectively, while compatriot Vandenbergh made it into fourth. Van Avermaet and Vandenbergh had originally broken away from an already depleted peloton with well over 20km remaining before they were caught by Cancellara and Vanmarcke just after their second ascent of the Paterberg climb. Race favourites Peter Sagan (Cannondale) and Tom Boonen (Omega Pharma-Quick-Step), as well as Britain’s Geraint Thomas (Sky), had been distanced at this point after Cancellara attacked on the Oude Kwaremont as he attempted to chase down the leaders. Vanmarcke was the only one able to follow the Swiss rider’s attack and soon the two of them worked to chase down the leading pair. When the four came together with around 10km to go, all but Vandenbergh took turns to give them a fighting chance of holding off the chasing Alexander Kristoff (Katusha) and then Niki Terpstra (Omega Pharma-Quick-Step), with the Russian from Katusha sitting only eight seconds off at one point before being joined by Terpstra. The gap was eventually extended to 33 seconds and while Vandenbergh, Vanmarcke and Cancellara all tried attacks out of the front four, the time gap allowed them to look at each other as they inevitably came into the last 500 metres together. As they slowed to walking pace with none of them looking like they wanted to attack first, it took until 300 metres to go for the former world time trial champion and classics specialist Cancellara to launch his attack from the back of the group. 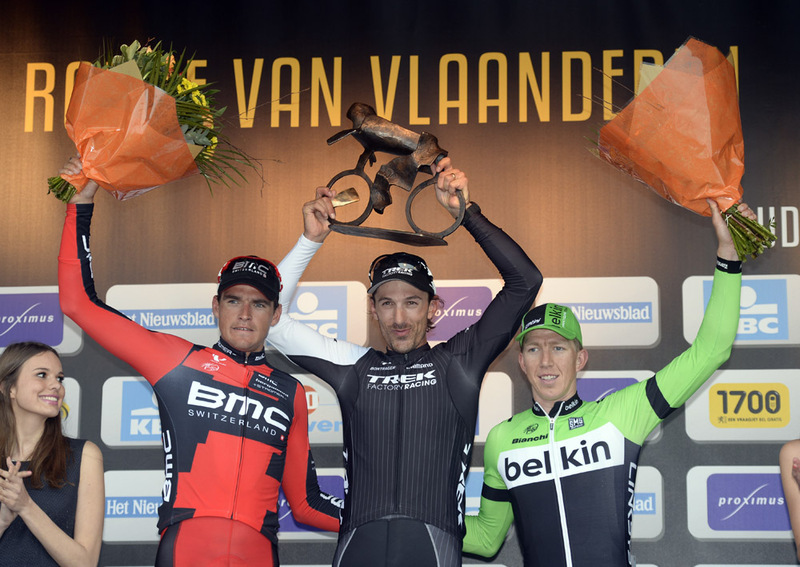 Getting the jump on his rivals, Cancellara managed to hold off Van Avermaet and Vanmarcke – who have both shown fine form coming into the race – to take his third Flanders victory and his second in a row. The race had started from Bruges with a string of early crashes, as the likes of Luke Durbridge (Orica-GreenEDGE), Martin Elmiger (IAM Cycling) and former Paris-Roubaix winner Johan Vansummeren (Garmin-Sharp) all pulling out of the race after crashing. It took nearly 40km for a break to finally get away, but when it did Stig Broeckx (Lotto Belisol), Davide Appolonio (AG2R), Daryl Impey (Orica-GreenEdge), Raymond Kreder (Garmin-Sharp), Wesley Kreder (Wanty Group), Alexander Kuchynski (Katusha), Andrea Palini (Lampre Merida), Taylor Phinney (BMC), James Vanlandschoot (Wanty Group), Jelle Wallays (Topsport Vlaanderen) and Romain Zingle (Cofidis) were the riders to distance themselves. They built up a maximum time gap of just over six minutes, but the length and demanding parcours of the race made it a real war of attrition, which eventually saw just Impey, Phinney and Broeckx left standing until they were finally caught just after ascending the Koppenberg with less than 50km to go. It was Cancellara though, who now joins the likes of Johan Museeuw and Tom Boonen on three Ronde wins, that showed why he was named as favourite for the second monument of the season. After what was a brutal yet thrilling race, Paris-Roubaix looks to be of even more interest as riders try to end the dominance of the man they call Spartacus.